20Q 3.0: Now 20Q is even smarter with version 3.0. 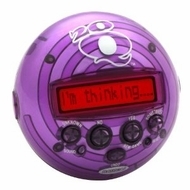 Think of anything, answer 20 questions, and be amazed as 20Q guesses your thoughts. Players think of something then answer a series of 20 questions until 20Q guesses what it is. A new trans-reflective screen provides easy viewing, larger buttons make it easier to play, and a backlight allows for more hours of play, day or night. Available in new metallic colors including red, purple and blue with an all-new back spray. There is even an UNDO button. 2-AAA Batteries Included. More play...more game. New questions, more answers, more intelligent banter.